Content by Tony Macklin. Originally published on June 19, 2017 @ tonymacklin.net. Wonder who? Wonder why? Wonder how? Wonder Woman is a "suspension of disbelief" movie. It is credible that its superhero is female (Diana/Wonder Woman - Gal Gadot). But the world around her strains and breaks credibility. 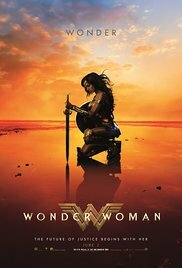 Wonder Woman is a fitful film - varying between high moments and well-worn conventions. It's seminal in its heroine - maybe not seminal, maybe somewhat fecund. Its settings - from a remote mythic island to World War I environs - are wayward and test credibility. The best moment in the film is when Wonder Woman walks across a battlefield as German troops and orchestra bombard her. It's stirring. This is what the film could be, but that euphoria isn't sustained. One wishes there were more of such images. Most of the film is Diana running through the orchestra. She leaps and soars to the sound of music. But the orchestra is a prop. It's overcome by explosions and duds of dialogue. "I am men." "I believe in love." Wow. The screenplay by Allan Heinberg is generally 1940s-movie conventional, but it has a few piquant lines - an occasional double entendre. Looking at the naked Steve (Chris Pine), Diana says, "You let this little thing tell you what to do?" Of course, she's referring to his watch. But much of the plot lacks any credibility. Diana goes into a British government meeting and lectures and insults the men. Sure. Wonder Woman is a film that tries to have it both ways. For someone who hates war, Wonder Woman is a killing machine. The film is anti-war in a pro-war way. Wonder Woman has piles of casualties, but the war is really bloodless. Even a spear that impales doesn't have a speck of blood on it. The cast is able. Gal Gadot is blandly appealing (a female Christopher Reeve) as Diana/Wonder Woman. Chris Pine brings his patented charm to the role of soldier and companion Steve Trevor. He exhibits boyish masculinity. Danny Huston chews capsules and the scenery as the evil German Ludendorff. Lucy Davis provides nice comic relief as Steve's helpful secretary. Director Patty Jenkins survives her experience in CGI - Comicbook Gal (Gadot) Interpretation. Jenkins did a masterly job nurturing Charlize Theron to her Oscar-winning performance in Monster (2003). In Wonder Woman, Jenkins is aware of Gal Gadot's limitations and doesn't test them. Gadot's performance is suitable but unmemorable. Theron is in the recently-released Atomic Blonde. No Monster there. Both Jenkins and Charlize seem to have turned more to action than character. At the end of Wonder Woman, Diana believes in love. Ok. Time for a leap into another bloodless sequel.